Usually, it is easier to develop short books for Project Gutenberg than it is to develop longer books, but sometimes short books can pose their own intellectual challenges. One such series of short books is the “CHILD’S OWN BOOK of Great Musicians” series (1915) by Thomas Tapper. These books have a couple of pages of illustrations so that the child can cut and paste those illustrations into the appropriate places to make a book and other places where the child can write a story about the musician. Recently, we posted four books from this series. One book was on Bach (Johann Sebastian Bach: The story of the boy who sang in the streets). Another was on Haydn (Franz Joseph Haydn: The Story of the Choir Boy who became a Great Composer). 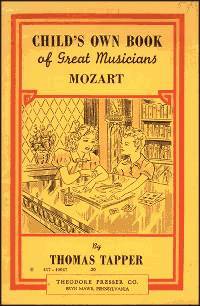 Still another was on Mozart (Mozart: The story of a little boy and his sister who gave concerts). The fourth was on Beethoven (Beethoven: The story of a little boy who was forced to practice). In each of these books, we produced an HTML file that shows what the finished workbook looks like, and a MIDI file that corresponded to an illustration of sheet music in the book (e.g., this minuet by Mozart). The MIDI files were produced by the DP Music Team. The Mozart book project and the Beethoven book project have something that the other two book projects do not: a PDF file that shows what the workbook probably looked like before being finished, and that PDF file can be printed out to make a workbook that a child can fill in, just like the books sold almost a hundred years ago. Creating that PDF file was an interesting and challenging experience. The reason why the Mozart book and the Beethoven book project have a PDF and the others do not, is that these projects differ from the other two in that they had the two sheets of illustrations intact. All in all, it has been an interesting challenge, especially the production of the PDF file, which was created in Microsoft Word. I learned a lot from it. Still, I am looking forward to working with longer, less challenging books.